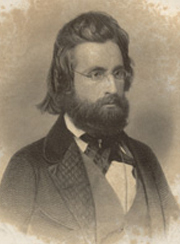 Andrew Jackson Davis is often referred to as the John the Baptist of Modern Spiritualism; for it was he who firmly set into place and definitively proclaimed the coming revelation of Spirit communion. Andrew Jackson Davis grew up in poverty. He was born at Blooming Grove, a small hamlet along the Hudson River , in New York State . His mother was a simple, uneducated woman, and his father, between binges of drunkenness, earned a scanty living as a weaver and a shoemaker.Young Davis showed signs of clairvoyance and heard voices very early in life and, on the advice given from Spirit, he convinced his father to move to Poughkeepsie in 1838. In 1843, Dr. J. S. Grimes visited the city and gave a series of lectures on mesmerism (hypnosis). With Davis ‘s curiosity getting the better of him, he attended one of the lectures and was tested as a subject, with no results. Later, a local tailor named William Levingston helped induce upon Davis a state of mesmeric trance and found that in this altered state of consciousness, he (Davis) could accurately diagnose medical disorders. In this condition, Davis described how the human body became transparent to his spirit eyes; this seemed to come from the center of the forehead. Each organ stood out clearly with a special luminosity of its own which greatly diminished in cases of disease. In 1844, Andrew Jackson Davis had an experience which was to change the course of his life. On the evening of March 6th, Davis was suddenly overcome by some power which led him to “fly” from Poughkeepsie , where he lived, and hurry off in a semi-trance state, upon a rapid journey. Upon gaining full consciousness the next morning, he found himself amidst the Catskill Mountains , some 40 miles away. Here, he claims to have met two very distinguished men, whom he later identified as the philosopher Galen and the Swedish seer Emanuel Swedenborg, both of whom were, of course, dead. He also claimed to have experienced a great mental illumination and revelation. Now, it is very difficult to ascertain exactly what happened to Davis during this evening: was the experience a vision; was it an actual levitation and/or transportation to the Catskill Mountains ; or did he really walk 40 miles in the trance condition? Regardless of what actually happened, the effect upon Davis was tremendous. From that time onward, he traveled extensively, giving public lectures and teachings. In the course of a teaching tour, Davis met Dr. Lyons and Rev. Fishbough. Dr. Lyons was a qualified mesmerist and often induced the trance state upon Davis . During these episodes, a wealth of material came through, all of which was transcribed by Rev. Fishbough. In November, 1845, Davis began dictating his great work, The Principles of Nature: Her Divine Revelations and A Voice To Mankind. The dictation lasted for 15 months, with many enthusiastic people bearing witness to these trance utterances. “In the beginning the Univercoelumm was one boundless, indefinable, and unimaginable ocean of Liquid Fire . The most vigorous and ambitious imagination is not capable of forming an adequate conception of the height and depth and length and breadth thereof. There was one vast expanse of liquid substance. It was without bounds – inconceivable – and with qualities and essences incomprehensible. This was the original condition of Matter. It was without forms, for it was but one Form. It had no motions, but it was an eternity of Motion. It was without parts, for it was a Whole. Particles did not exist, but the Whole was as one Particle. There were not suns, but it was one eternal Sun. It had no beginning and it was without end. It had not length, for it was a Vortex of one Eternity. It had not circles, for it was one infinite Circle. It had not disconnected power, but it was the very essence of all Power. Its inconceivable magnitude and constitution were such as not to develop forces, but Omnipotent Power. One can see clearly from this passage that much of the teaching that was given through Andrew Jackson Davis is similar in style and content to that of Emanuel Swedenborg; yet Davis was not at all an educated person during his earlier years. It is this fact, we feel, which makes the revelations of Davis so very interesting. Here we have two seers, Emanuel Swedenborg and Andrew Jackson Davis. Each came from totally different social, economic and educational backgrounds, yet both were channels for some of the most profound and esoteric philosophies and teachings to come out of the eighteenth and nineteenth centuries. At that very moment, not too far away, in Hydesville , New York , the events which literally shook the world into looking at the very real possibility of communicating with those in Spirit were taking place. Indeed, the good work had begun. The contributions made by Andrew Jackson Davis to the cause of Spiritualism simply cannot be enumerated. This simple, uneducated man, through whom so very much was given, should be noted as the prime forerunner to Modern Spiritualism. From 1845 to 1885, he wrote over 30 books dealing on subjects from cosmological philosophy and dissertation, to health, to a descriptive analysis of the afterlife. n the latter years of his life, having finally acquired a medical degree, Andrew Jackson Davis retired to Boston , where he opened a small book shop. There he sold books and prescribed herbal remedies to his patients.